I'm new to the forum but not to Tokai guitars. This is a great forum and you all are so much more civil to each other than the folks at the Gibby / Epi forums. Anyway, maybe someone can help me. 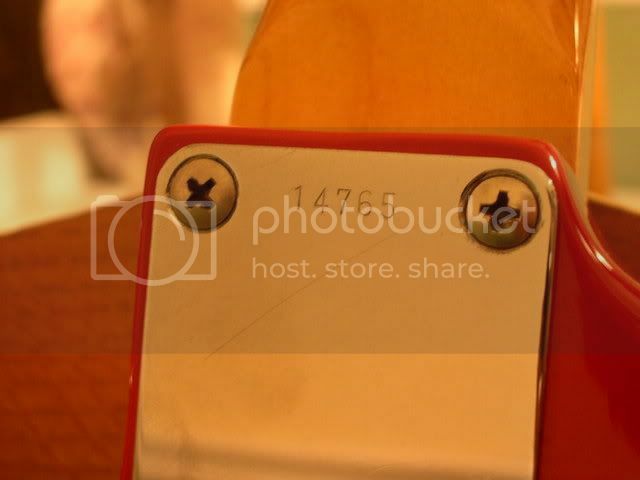 I would like to identify my Tokai guitar. It is a TST 62 with grey bottom "E" series pickups (which are tone to the bone). No stripe neck. 5 digit serial no. I bought it in Nashville, TN around 1989 or 1990. I would like to know, if it is possible to know, what year it is. I will include a few pics. BTW this is the best guitar I've ever owned. I used to work for Gibs0n and I've bought sold and traded away several dozen high dollar guitars over the years but this one always stays. The Kahler knock off was on the guitar when I bought it. I doubt it is stock but it has no markings on it at all. Tell me what you think Tokai experts! 4/11/07 Update: I changed the strings recently and took the neck off to get some more pics. The neck has the expected Tokai numbering but the pocket does not. The body does have a center seam which leads me to be even more convinced that it is a 2 pc body. The center seam may be hard to see in the pic but it is obvious in person. I still think it is nitro finished based on the checking in paint. I could be wrong and it doesn't really matter whether it's nitro or poly. We all want to have the golden ticket to the chocolate factory, don't we? Anyway, I am happy with the guitar whether it is all original or not. I will probably post it officially in the registry soon. Enjoy the other pics. nice guitar, but the logo just dosen t seems right too me. let s see what s others have to say about this. Thanks for the welcome Marc. I've been looking at this forum for about a year and decided to join. 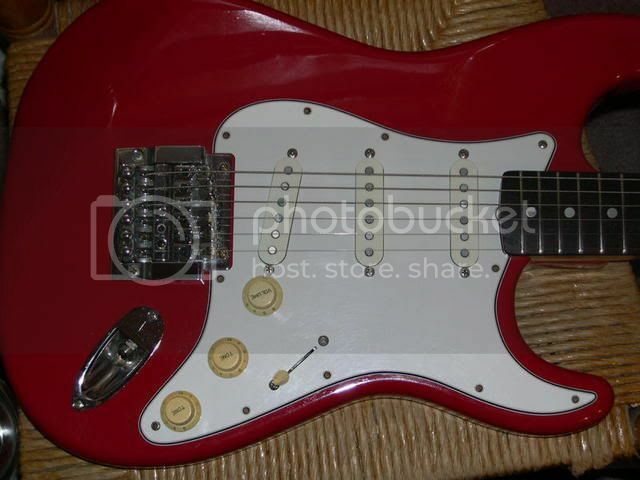 I will be changing the strings on it soon and I will take the neck off and look at the markings on it and the pocket. I'm not sure what would be suspect about this guitar. I bought it before the Tokai craziness began and I have been the only owner for almost 20 years. 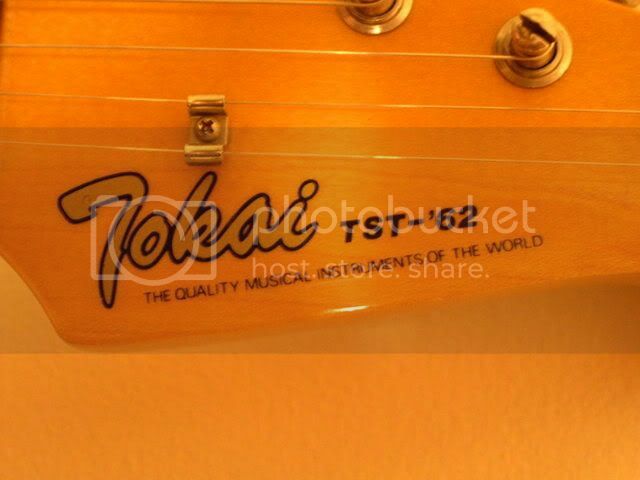 The headstock logo is identical to the one on the Tokai registry ID page for Fender copies, 1984 model (Lower right hand pic). I could be wrong but I don't think anyone in Nashville cared enough to make a forgery of a Tokai Strat in 1989.
enjoy your baby, she is beautifull!!! I've only seen one other fiesta red TST 62 like this one and it was around 1993 in a different music store in downtown Nashville. I wish I had bought it but I didn't know what I had even then. It was only when I saw what Tokai's were selling for on ebay that I realized how rare the older ones are. 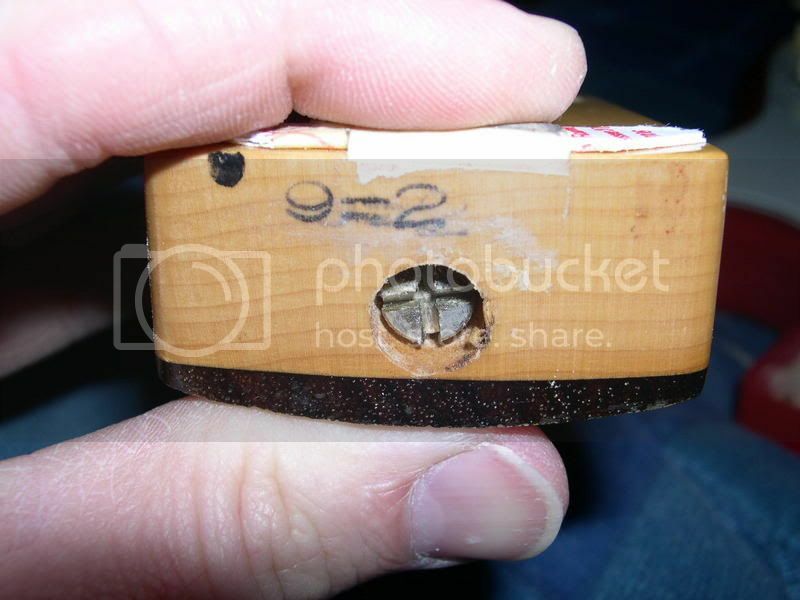 The guitar has some dings and nicks but only one through the finish. I really wish it still had the original bridge on it. But that didn't keep me from buying it. This thing is heavy which makes me wonder if it is ash. I don't really care cause the tone nails a vintage strat. I had emg's in it for a while and although they are deadly quiet they don't have the character of the "E" series Tokai single coils so I put the originals back in and put up with the hum. Does anyone know if the TST had a nitro finish? 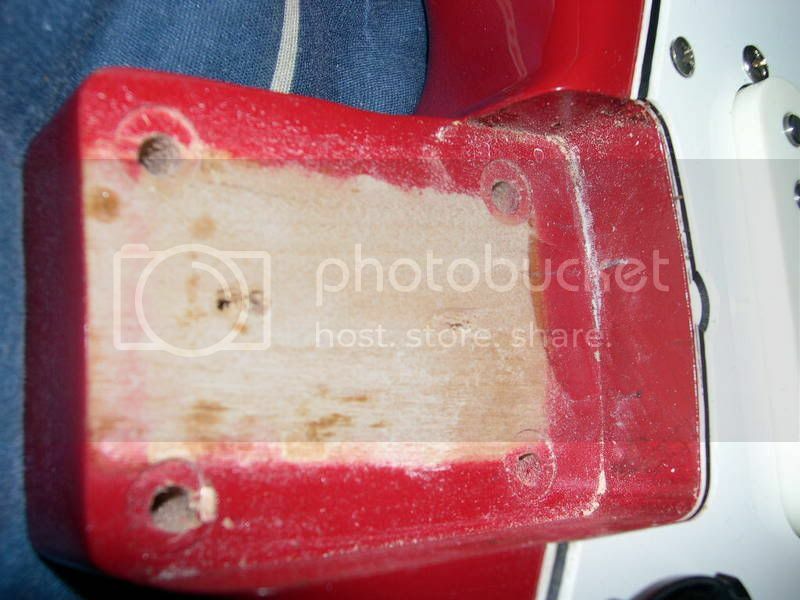 The reason I ask is because this guitar has finish cracks just like an old gibby. Maybe thin poly does that too after a long time. I'm no expert on finishes. This guitar could have been refinished before I bought it. She sounds sweet through a tube amp! Texas Flood, Mary Had a Little Lamb, Voodoo Chile, etc. are really fun to play on this guitar. I'm a SRV nut but I didn't know he was a Tokai endorser until way after I bought this guitar. I understand why. yeah those E pickups are sweet!!!! i think they were made by Dimarzio only found on high end models, that s makes me wonder if they were originally used for st62 (which is supposed to be a low end models, but still sweet to me!!!). I have a Springy ST55 from 81 with the U stamped pickups and they are exactly spot on a 50s era tone. Huge sound, i love it, i thought about switching to E pickups or maybe something else, but i ll always keep the originals ones. According to me, the finish is poly, but really thin as usual on Tokais guitars. Not the thick stuff you can see on an Epi, that s why it s crackling. Your TST really shine with this fiesta red, i love it. The body should be alder and made of 2 or 3 pieces, ash is used for high end models and with less pieces, usually 1 or 2. That's the confusing thing about trying to ID this guitar. I have a page from the 1985 catalog with the specs for a tokai "AST 62" strat and it looks exactly identical to mine except that mine says "TST" not "AST". The catalog says that the AST were built from 2 piece ash and one piece neck and have the high end pickups. I have read some other posts here that the only difference between the AST and the TST was that the AST was built for export to the US and the TST was built for Japan only. If that is true then how did my guitar end up in the used rack of a music store in Nashville, TN? Maybe a pro player picked it up on a japanese tour and brought it home? The Kahler on it is definitely aftermarket cause you can see the wood through the spring pocket in the back. It works quite well it's just gaudy looking. It's all a bit confusing since Tokai built great guitars with little or no documentation. I don't want to drive myself crazy trying to figure this out since I don't intend to ever sell it anyway, but it would be nice to find out all there is to know about it. I agree with you about the poly on the Epiphones. I have a Epi LP Elitist and it is a wonderful guitar in every way except that it is encased in 3mm of plastic. Don't forget to set your clocks back tonite. Actually they go ahead an hour. Yeah, it is forward one hour. I got it backwards. So can anyone give me an idea about the age of my TST 62? You are correct about the AST / TST designation regarding export and domestic models...American STrat / TokyoSTrat Some TST's have come home with Tourist's. I bought a TST in 97' from just such a person. Regarding the Kahler...Can it be removed and broght back to spec? A TST is a great guitar, a quality peice, just enjoy it. If she can rock your world, who cares How Old She is? Everyone I posted more pics as an edit to my original post at the top of this thread. Neck markings and pocket. Enjoy! I just discovered this forum. If it helps, I bought a TST-62 Vintage Series brand new here in Texas in the early 80's. Mine is black and it's serial number is 14275. It came with a 50's style green case with pink lining (looks better than that sounds).